You are currently browsing the archives for the technical translation tag. Couple days ago I was invited to a technical excursion as a Russian-English translator. The organizers of the excursion let me know about it one day in advance so I had some time to prepare some specific vocabulary. I read up about civil and industrial engineering, about some materails and machinery used in the construction work, about kazakh and foreign companies involved in this process, etc. As it was a bus excursion, I had to do consecutive translation from Russian into English using a microphone. The bus drove us through Astana and we got to know Old center of the city and a New (administrative) one. 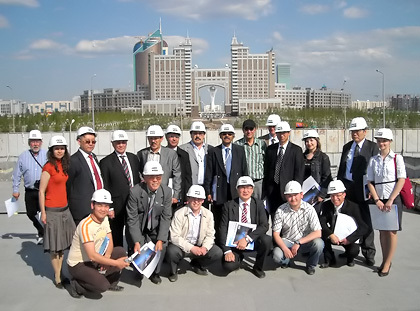 Astana is a great building site and lots of foreign companies invest their capital in the construction. We went sightseeing in Astana and our guests from Korea, Japan, Portugal, Brazil, Russia, Tadjikistan and other countries could give a glance at the Palace of Peace (Pyramide), the residence of President, the Palace of Independence, Baiterek-the symbol of Astana and other incredible places of the city. Our first stop was at the national stadium that will have been finished by the next year. We learned that Michel Platini had already seen the project of the stadium and also that “Milan” was going to come to the inauguration of the first stadium with the movable roof in Astana. This stadium will be the place of Asian games in 2011. Next object was the abuilding cycling track that is located right next to the national stadium. These two project are being conducted simultaneously. We were told that once the cycling track has been finished there is going to be a team of 3 cylists from the international sport organization to check if the track meets all the international requirements. Last object we got to visit was Han Shatyry Entertainment center. That was actually the end of our excursion and I hope that our guests enjoyed their time in Astana and will come back again.